This is an Spicy Sausage Pasta recipe that you can enjoy when calorie counting or following plans like Slimming World and Weight Watchers! It’s no secret that I adore pasta! 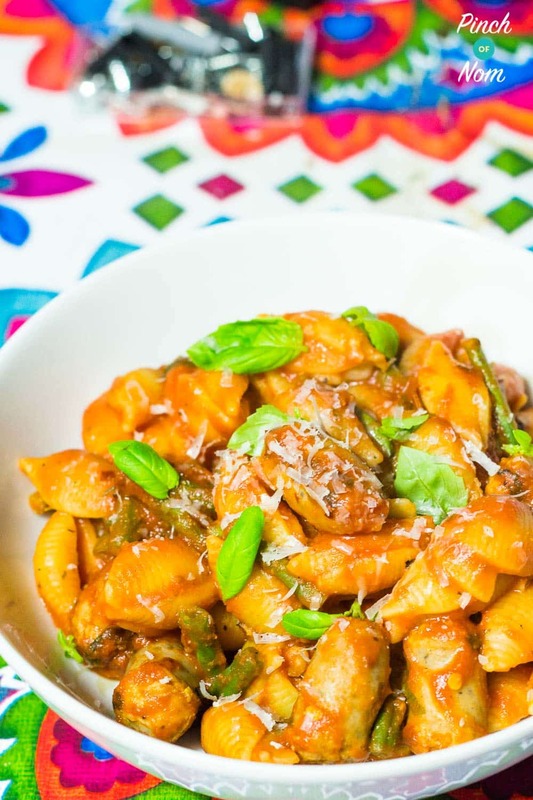 This Spicy Sausage Pasta dish is one of my go-to slimming favourites and is so quick and easy. 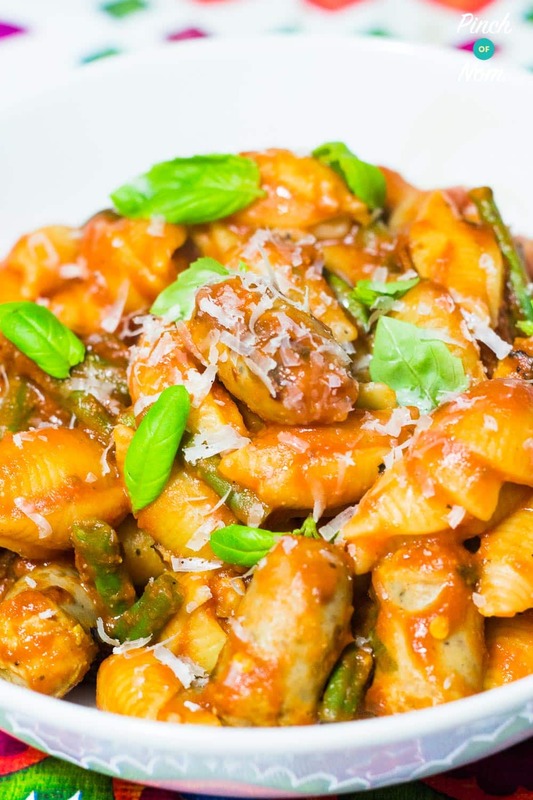 This recipe can be easily bulked out for extra portions by adding extra pasta and green beans. It’s super thrifty and reheats well for lunches or a quick supper. The key ingredient in this dish is of course, sausages! There are lots of different types of low fat sausage you could use in this recipe, it really comes down to personal preference. You could even use veggie sausages if you wanted! You’ll find that choosing which sausages to use is the hardest part of this recipe, it’s so simple, and perfect for a quick mid week meal. 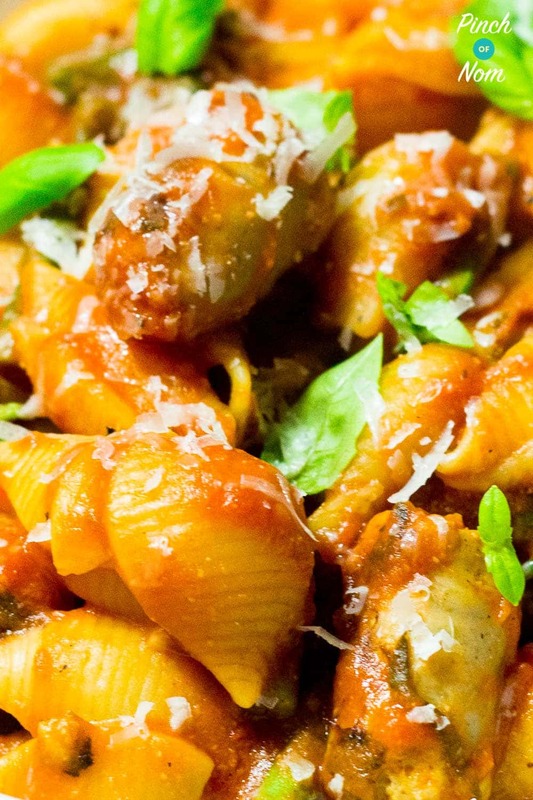 How many calories is this Spicy Sausage Pasta recipe? 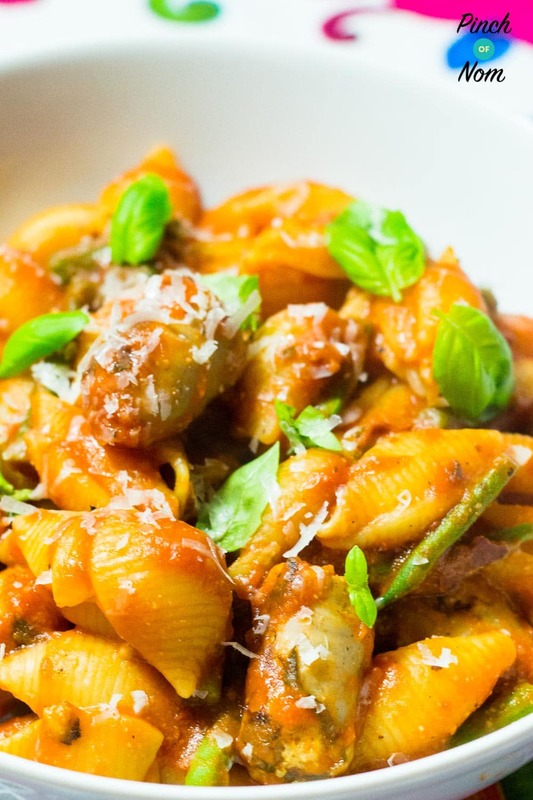 This Spicy Sausage Pasta dish is 208 calories per portion using sausages that are 78 calories each. If your sausages are more or less calories than this, make sure to adjust accordingly! How Slimming World Friendly Spicy Sausage Pasta recipe? All the ingredients in the Spicy Sausage Pasta recipe are Syn Free apart from the sausages. The sausages we used were 0.5 Syns each, meaning there are 0.5 Syns per portion. 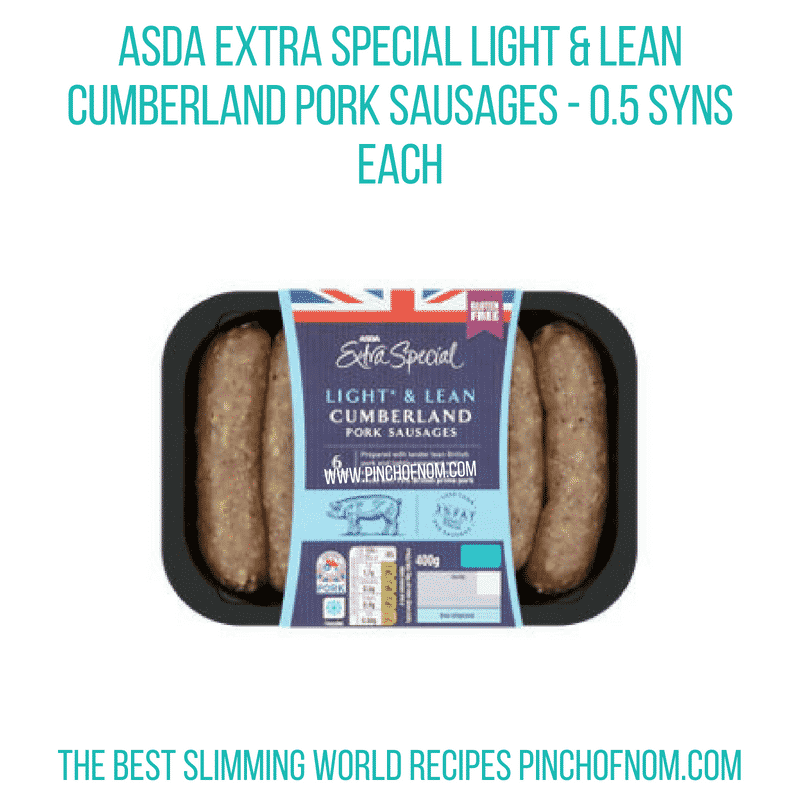 However, you could use the Syn Free Slimming World sausages, or whichever type is your favourite. Just remember to add on the extra Syns if they are more in the sausages you chose to use. How Weight Watchers Friendly Spicy Sausage Pasta recipe? 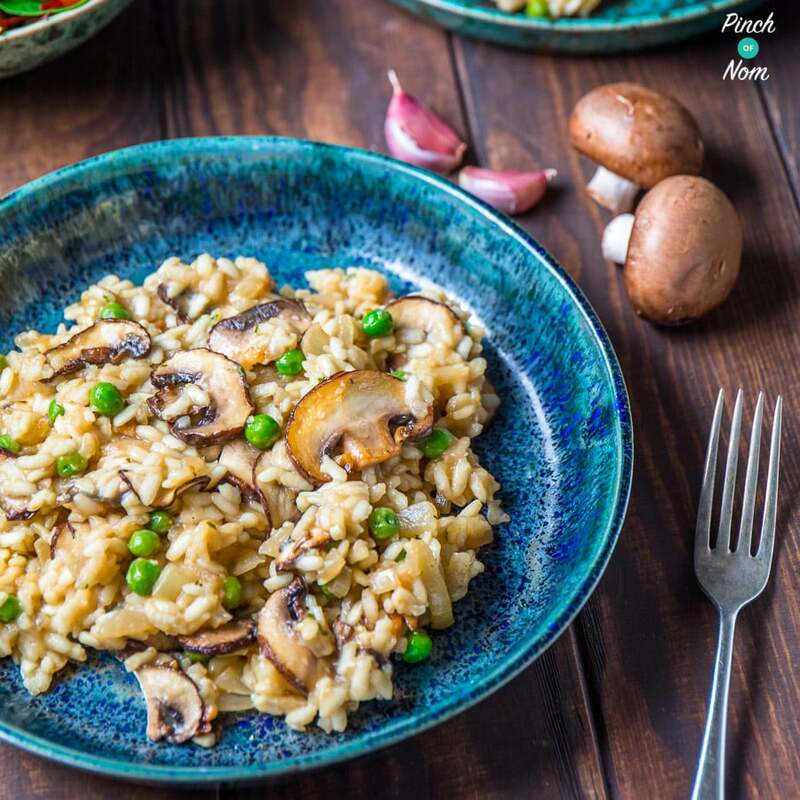 As a guide there are 8 Points per portion in this recipe. However, this may vary depending on the type of sausages you use. We advise using the Weight Watchers app to log the ingredients so that you get the most accurate value! Like this Low Syn Spicy Sausage Pasta? You might like these Slimming World pasta recipes! 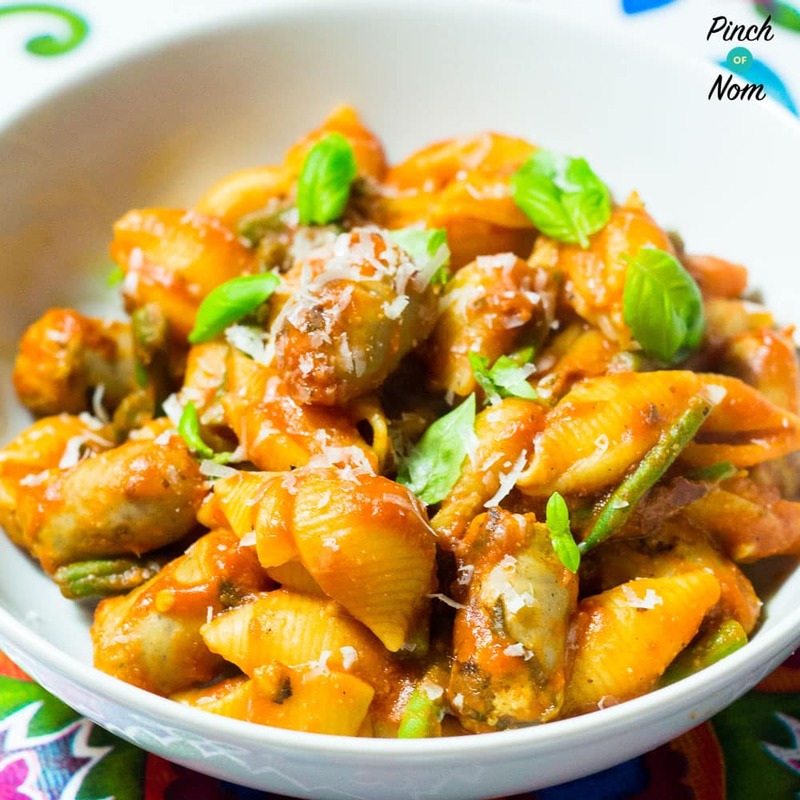 Some of you love this Low Syn Spicy Sausage Pasta recipe! Cut the cooked sausages into 2cm pieces and place into a saucepan on a medium heat. Spray with a little low calorie cooking spray, then add the chilli flakes, garlic and cook for 1 minute. Pour in the passata and add the oregano and half of the fresh basil. Cut the green beans into 2 cm pieces and add to the pasta 2 minutes before the end of cooking. Made this with Heck Italian sausages, It was a few more WW points than 8, as the pasta was that on its own, but it was delicious.